This was a very quiet spell, as expected, but there were still one or two sightings of interest. A single Sandwich Tern was the highlight of the 25th, but the 26th brought a small influx of 7 Siskins, a count of 142 Golden Plovers and 45 Curlews heading south. A couple of Crossbills a Peregrine and a Common Sandpiper were seen on 27th, along with a bit of visible migration that included 5 Swifts, 5 Whimbrels and 27 Curlews. There was no sign of the Blyth's Reed Warbler, and there were no new birds seen. The 2 Little Terns were still in their favourite spot near the club house on the golf course. A lot of excited Black-headed Gull activity in the middle of the night was caused by an emergence of Ghost Moths in the fields next to the observatory: the gulls were hovering and swooping over the grass trying to catch the moths as they took flight. 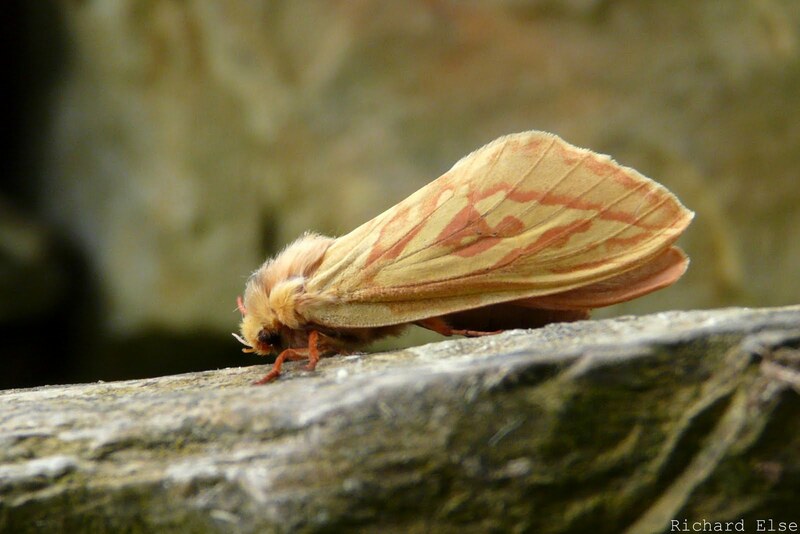 Female Ghost Moth. The males are smaller and have mainly white forewings. This species feeds on a wide variety of plants, including strawberries, potatoes and cannabis. 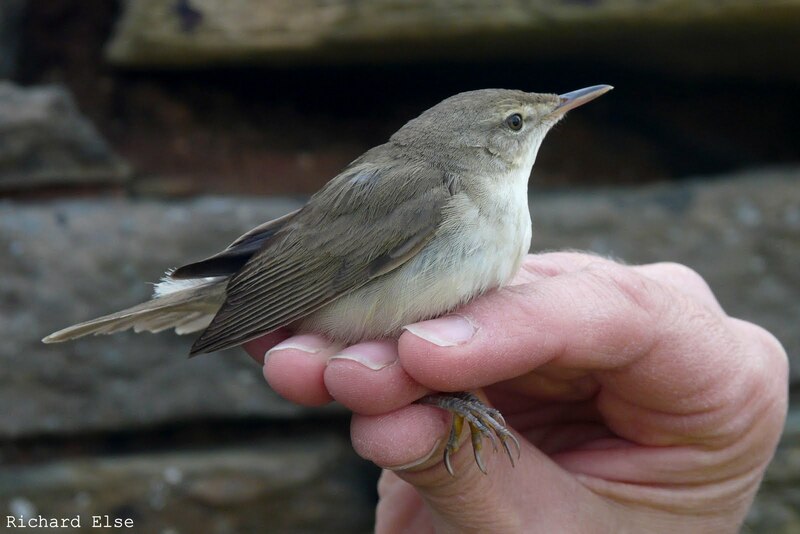 Virtually nothing of interest was seen during the day, but the second Blyth's Reed Warbler of the year turned up in a mist net at Holland House in the evening. Just like the bird from two weeks earlier, it was found on a day almost completely bereft of other migrants and chose to forage in the same corner of the garden. 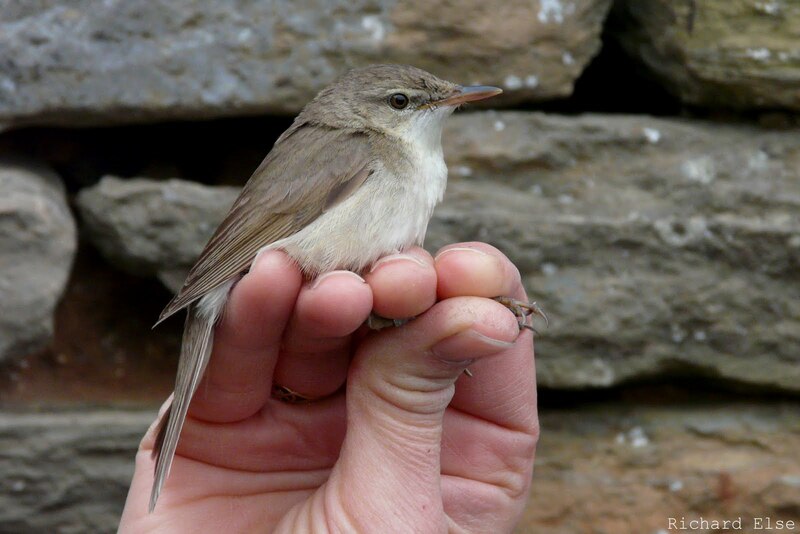 This is the eleventh record of Blyth's Reed Warbler for the island and, almost unbelievably, the fourth in nine months. For anybody interested in the fine details of Acrocephalus identification, the lower picture shows several key features of Blyth's Reed Warbler: the short primary projection, plain tertials and emarginated fourth primary (particularly strong on this bird) are all clearly visible. Contrary to popular belief about this species, neither of the birds this year have had a dark-tipped lower mandible and neither has been seen to adopt a banana-shaped posture. The 2 Little Terns were still in Linklet Bay, and 3 Manx Shearwaters passed by at sea, but there was really nothing else worth reporting. The day's ringing expedition was to the Common Gull colonies in the north of the island, where numerous chicks were found hiding among the stone walls and long grass. 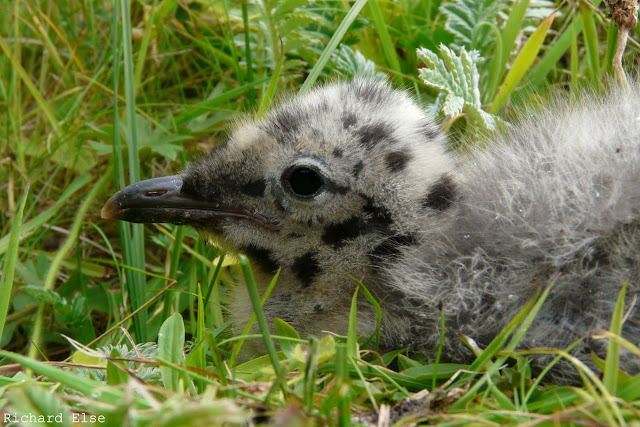 There are several Common Gull colonies on North Ronaldsay, with birds nesting on the ground or on top of the low dykes (walls). After the briefest of absences, sizeable flocks of waders returned to the island, including 44 Bar-tailed Godwits ,15 Knots, 27 Sanderlings and 113 Turnstones. 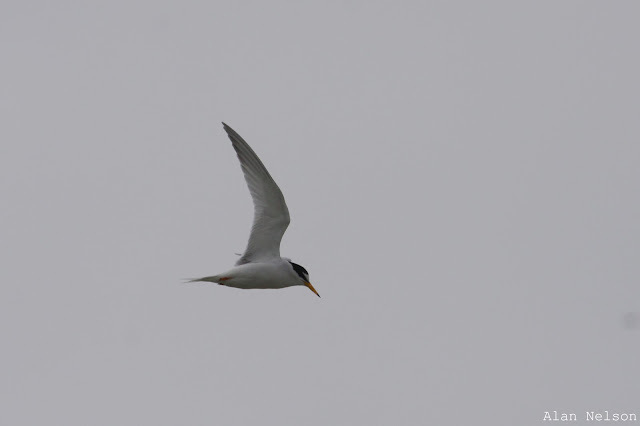 The best sighting of the day was a pair of Little Terns, a new species for the year, flying along the links. Little Terns have occasionally nested on North Ronaldsay, although in most years they are a very scarce visitor. A single Chiffchaff at Hooking was probably the only new sighting. The only lingering birds of note were a female Garganey, the Garden Warbler and a Siskin. 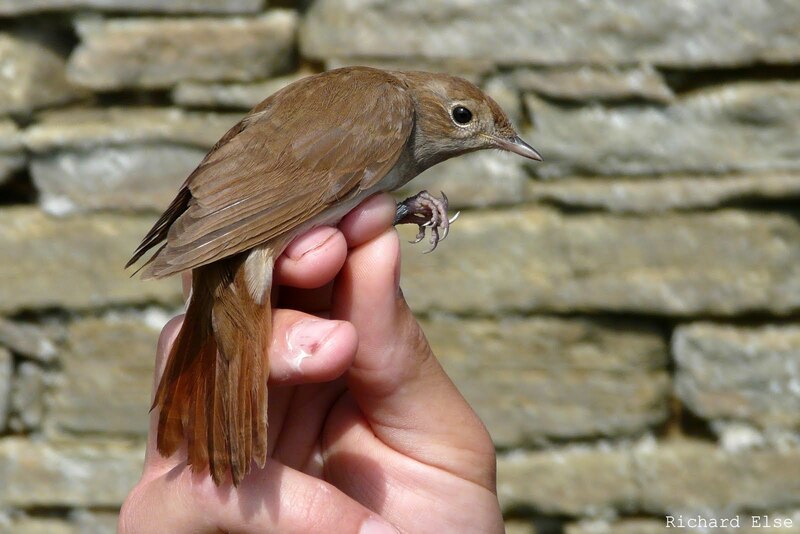 The Common Nightingale was retrapped at Holland House in the morning, but there were no new birds to report: the spring migration might finally have come to its end. A female Garganey, presumably a long-staying bird, was at Bridesness again. 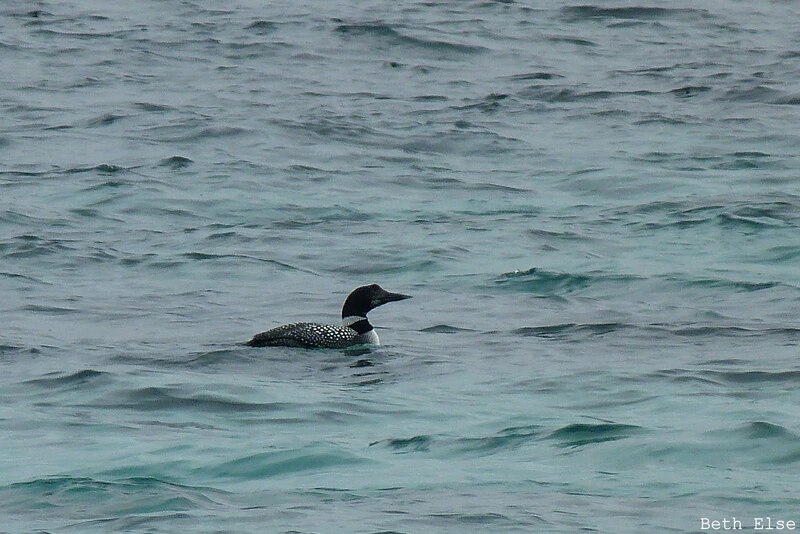 There are still a small number of Great Northern Divers around the coast, including this summer plumaged bird that has been heard singing in Nouster Bay. 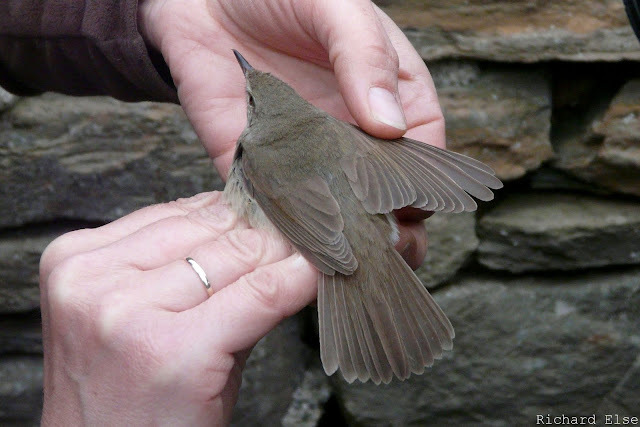 The first Marsh Warbler of the year was at Holland in the morning, but managed to avoid capture in the mist nets. Other new birds included a Garden Warbler, a Willow Warbler, 2 Spotted Flycatchers and a Woodpigeon. A Common Redpoll, 5 Siskins and a Woodpigeon were also seen. A search for the previous evening's interesting flycatcher drew a frustrating blank. 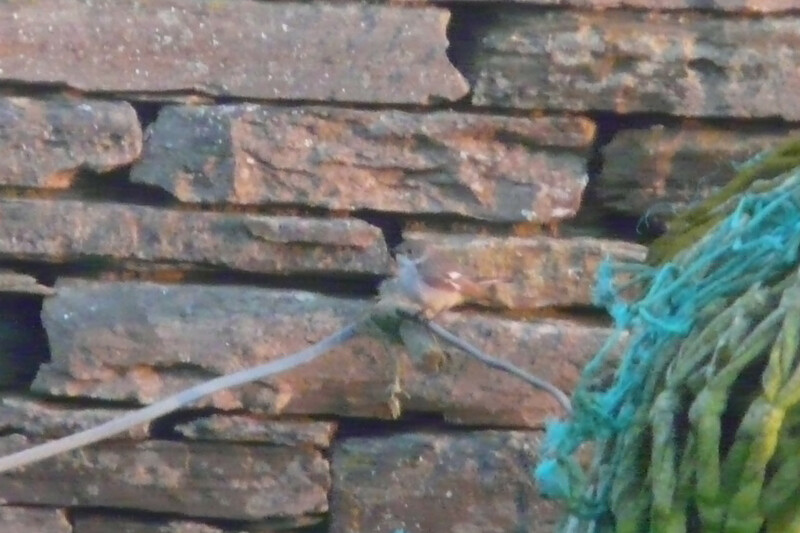 A grey-toned female Ficedula, it showed several features that suggested Collared Flycatcher, but difficult views in very poor light conditions meant that some important features were never seen well. The following unedited photos were taken late in the evening. Informed comments would be very welcome. Although rather late in the spring for good birding, light easterly winds still brought some quality new birds and a really enjoyable day. 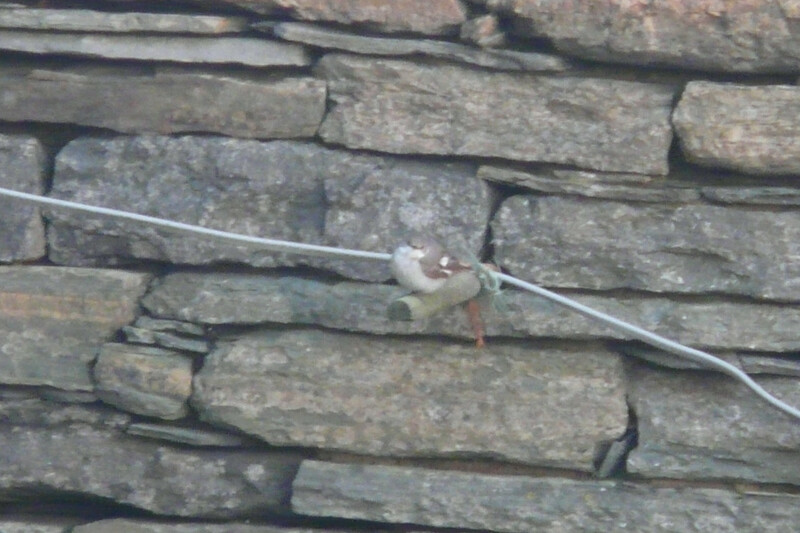 The morning began with 2 new Red-backed Shrikes, a male and a female, and a Crossbill in Holland House garden. An unidentified nightingale was seen fleetingly in the dense bushes of the garden and, after a couple of hours of waiting, it reappeared in a mist net allowing it to be confirmed as a Common Nightingale - only the fifth ever record for the observatory. Later in the morning a Shore Lark, only the second June record here, was found near Trolla Vatn. 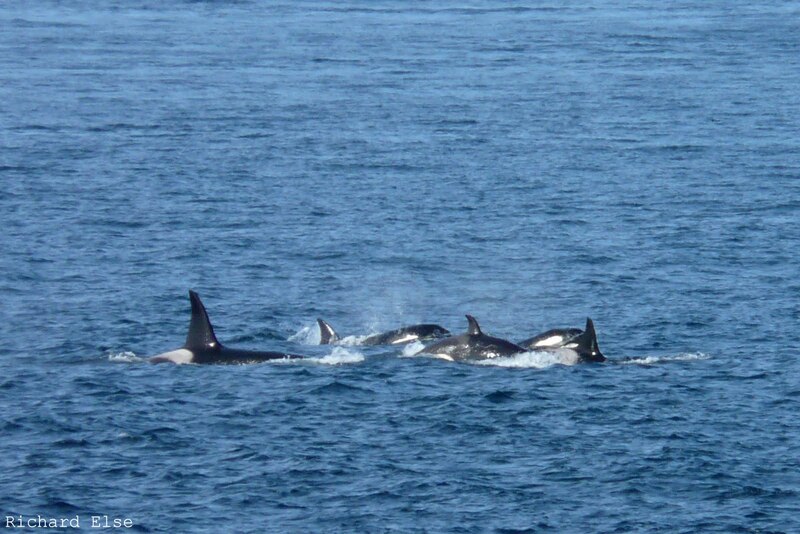 The obs staff drove up to see the lark just in time to find a pod of at least 7 Orcas just offshore near Seal Skerry. 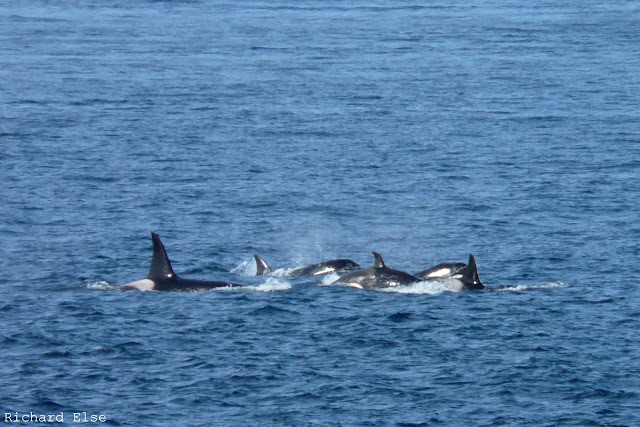 The Orcas were tracked around the coast and were later viewable from the comfort of the observatory beer terrace! While viewing the Killer Whales, 3 Storm Petrels (yet another addition to an already impressive year-list) were seen offshore, a Curlew Sandpiper was found in a nearby flooded field and, bizarrely, a Pipistrelle bat was seen flying around the lighthouse in the midday sun. Other sightings included a Pink-footed Goose, a Swift, 3 Common Whitethroats, 2 Chiffchaffs, 3 Spotted Flycatchers and an unseasonal Brambling. The day finally ended on a more frustrating note, with a difficult female Ficedula flycatcher leading us all a merry, and ultimately inconclusive dance around Upper Linnay in the failing evening light. 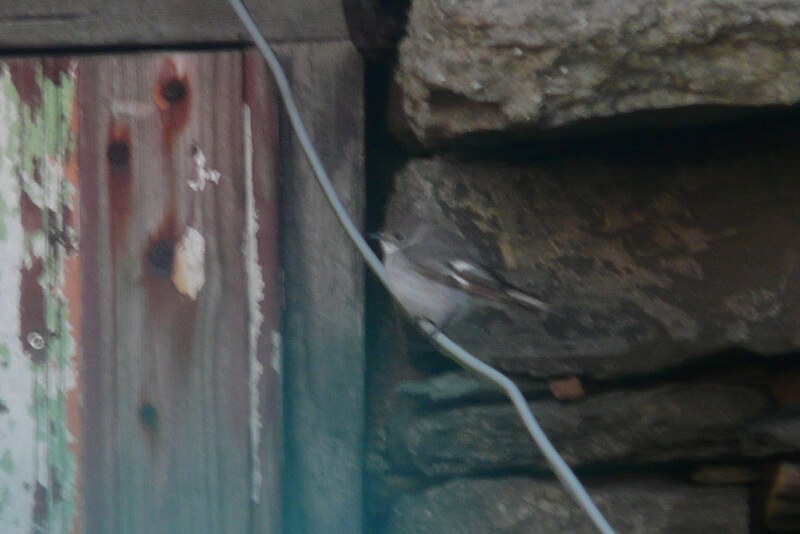 Views were either fleeting or in semi-darkness, but it showed several features suggestive of Collared Flycatcher. A day of non-stop torrential rain was not very productive for finding birds. A new Whitethroat was near the observatory and 3 Chiffchaffs, 4 Siskins and a male Red-backed Shrike were in Holland House garden. The shrike was possibly a new bird, but it was not seen well enough to ascertain whether or not it was ringed. A male Common Crossbill was the clear highlight in an uneventful day's birding. A Kestrel and a Willow Warbler were both new, and 2 Spotted Flycatchers were seen. A Curlew Sandpiper at Trolla Vatn was the only notable new bird. The Common Whitethroat in Holland garden was trapped and found to be wearing a Danish ring. Other odds and ends included a Black-tailed Godwit, 15 Bar-tailed Godwits, 1 Spotted Flycatcher, 1 Chiffchaff and 2 Siskins. The first fledgling Wheatears have left their nests in the last few days. Fine weather early in the morning lasted just long enough for 2 Common Crossbills to be caught and ringed at Holland House, but soon gave way to miserable rainy and windy conditions that persisted for the rest of the day. 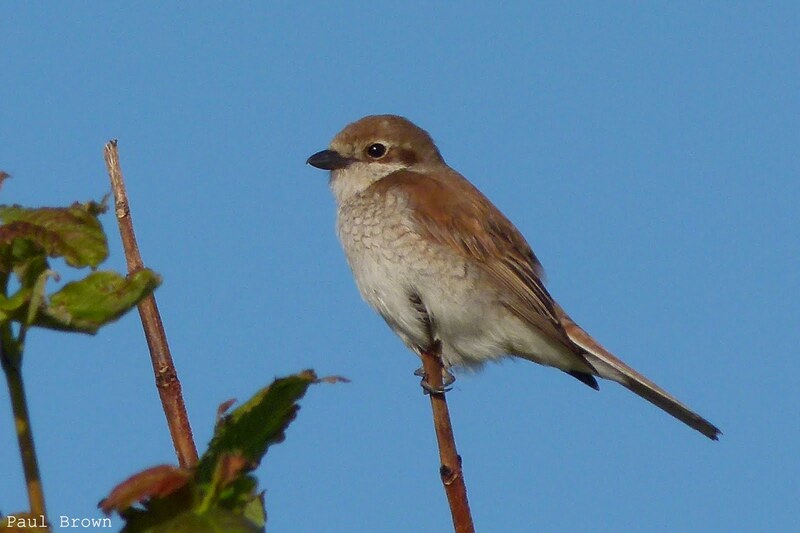 The Red-backed Shrike was still sheltering in the gardens, a Whitethroat, a Blackcap and 2 Chiffchaffs were seen and 2 Siskins were still around. The newly renovated gull / crow trap near the observatory has proved highly effective in recent days and numerous Great Black-backed Gulls and Black-headed Gulls, along with smaller numbers of other species, have been caught for ringing. 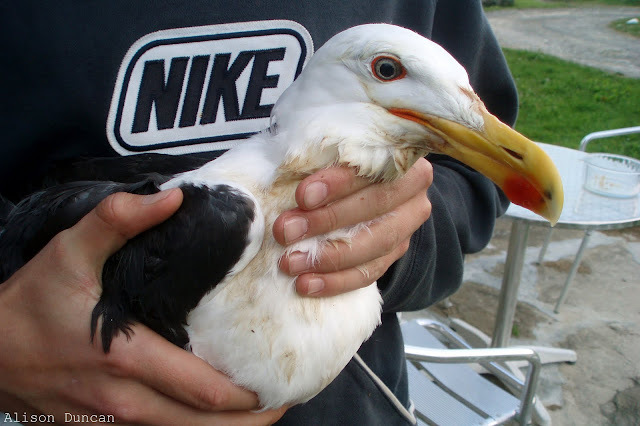 A particularly big and ugly example of an adult Great Black-backed Gull, and some blatant, though unintentional, product placement. Other brands of sports sweatshirt are available. A singing Lesser Whitethroat at the surgery was just about the best of a very thin selection of new birds. The male Red-backed Shrike was seen again near Kirbest, the Quail was still singing near Holland House and a Garganey was seen again. 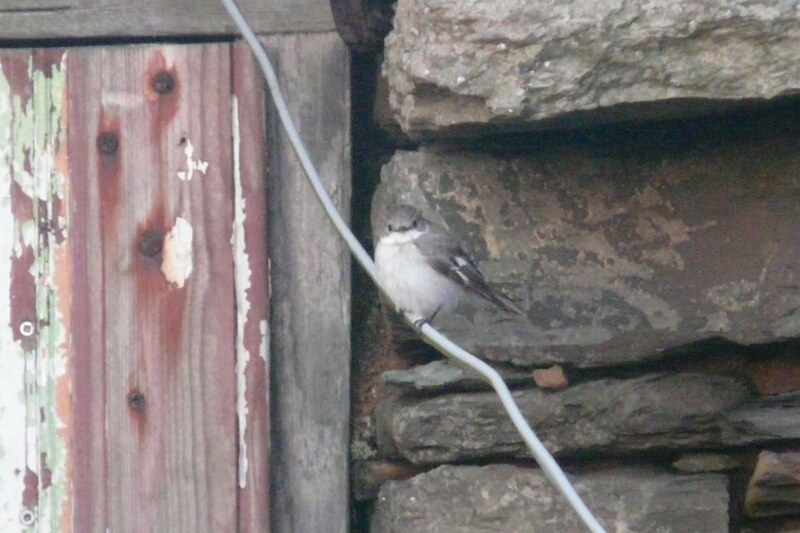 A Spotted Flycatcher was at the old church and 8 Siskins were seen. A pod of 5 Orcas, presumably the same group that was seen last week, passed by the east side of the island heading north in the evening. The best new bird of the day was a Red-necked Phalarope that was watched being harassed by local Great Black-backed Gulls off Tor Ness. The Icterine Warbler was trapped and ringed at Holland, the Bean Goose was seen flying south and a drake Garganey was on Hooking Loch. There was little else of interest, although 4 Woodpigeons were seen in the morning and 4 Collared Doves were present. 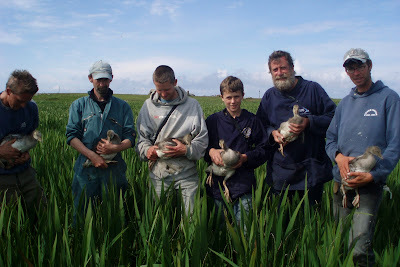 An afternoon expedition was made into the iris bed jungles of Hooking Loch to ring Black-headed Gull chicks and Greylag Goose goslings. Only 5 gull chicks were found, a disappointingly low number that is typical of recent years; but a good total of 26 geese, including 2 adults, were ringed. The NRBO staff: always looking for Ansers. 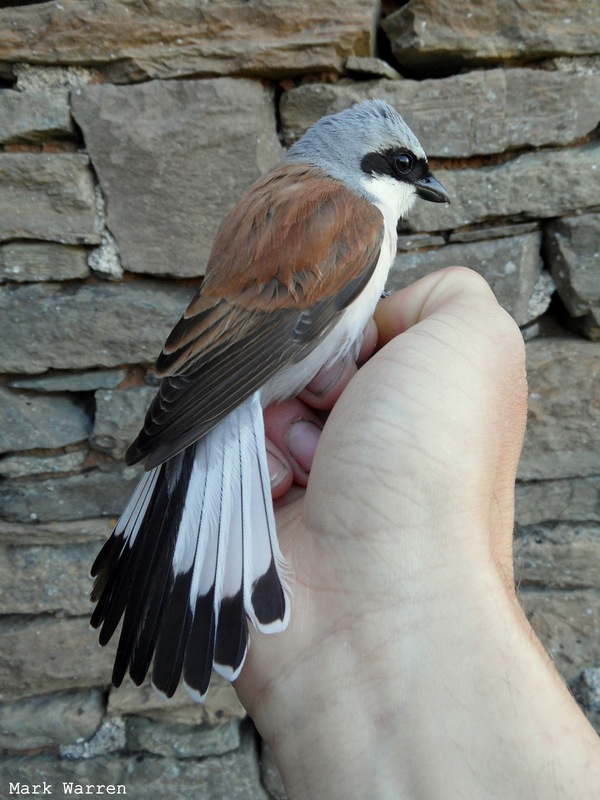 The first Red-backed Shrike of the year, a smart male, was ringed at Holland House early in the morning but was not seen subsequently. An Icterine Warbler and a singing Quail were also at Holland House in the morning, a late Fieldfare was at Hooking, a female Garganey was near the post office and the Bean Goose was re-sighted near South Gravity. A Pink-footed Goose was also present, along with the Peregrine, and notable small birds included 10 Collared Doves, 2 Chiffchaffs, 2 Spotted Flycatchers, 2 Siskins and a Lesser Redpoll. There was little to report on an uneventful, sunny day. A Sparrowhawk and a Peregrine were both new birds; 2 Barnacle Geese and a Pink-footed Goose were the only unseasonal wildfowl; and a female Garganey was again near the mill. A couple of Lesser Redpolls were the best of a scanty selection of migrant passerines that also included 2 Siskins, a Blackcap, 2 Chiffchaffs and a Willow Warbler. Golden Plover numbers are already beginning to increase again, with a count of 23 being the highest for some time. For those of us who like nothing more than bizarre hybrids and other wildfowl of dubious origins, this spring has provided plenty of excitement. Today's unexpected offering was a Bar-headed Goose that flew over the island early in the morning. Some may scornfully dismiss this bird as an escapee from a widlfowl park, but we like to think that it is a genuine wild bird that has travelled here, along with the previous day's Blyth's Reed Warbler, all the way from their shared winter range in the Indian Subcontinent. 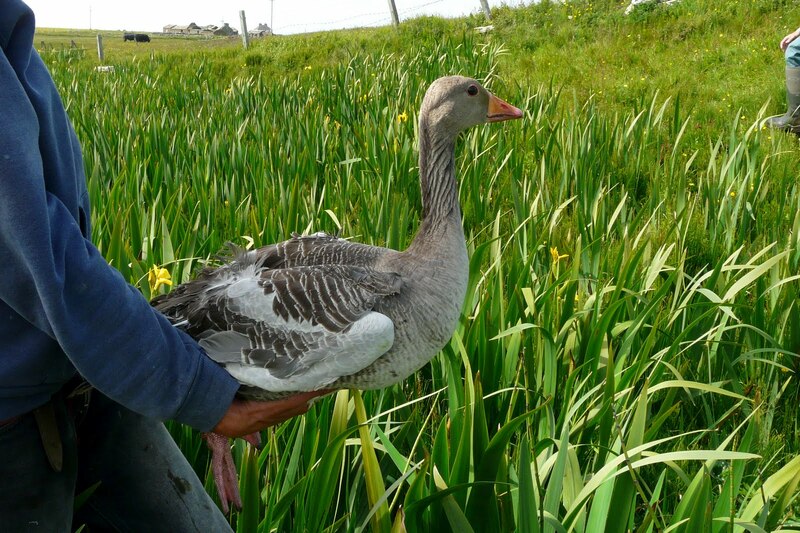 Interestingly, there are four previous records of Bar-headed Goose on North Ronaldsay, and all have ocurred in May or June - compelling evidence of a natural vagrancy pattern. Perhaps. As far as birds that were definitely not plastic were concerned, an Icterine Warbler in the surgery garden was the day's highlight. A Sedge Warbler at Holland House was a new migrant, as was a Lesser Whitethroat; 2 Chiffchaffs, a Willow Warbler and 3 Siskins were seen; and a Kestrel arrived early in the afternoon. 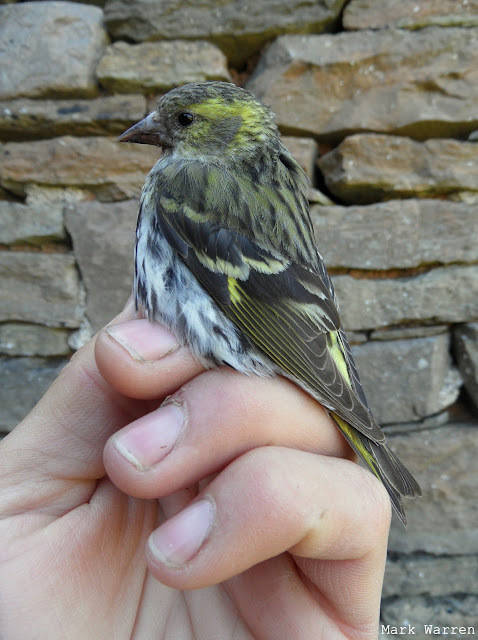 Siskins have been seen most days recently, but it was a surprise to find that this female had a large brood patch. Further light easterly winds produced a classic late spring one-bird day. Hardly any new small migrants were found at all, except for a Blyth's Reed Warbler that spent the day singing at Holland House. 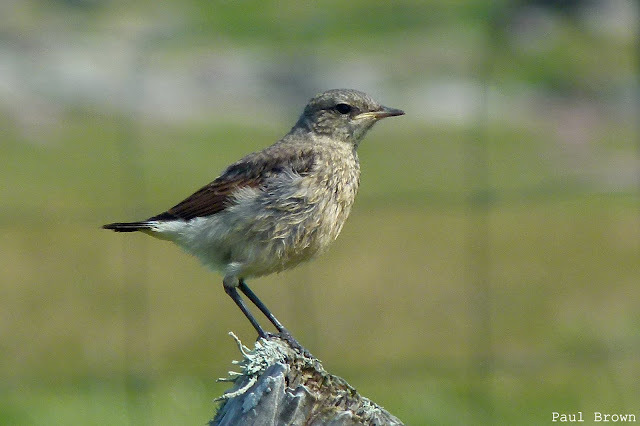 This is the tenth record of the species on North Ronaldsay (although 2 from autumn 2010 are still awaiting official acceptance from the rarities comittee), and only the second ever in spring. A Quail singing near the school and a female Scaup (a different individual to the recent long-staying bird) on Ancum Loch were the best of the day's other sightings. The Taiga Bean Goose was still near Hooking Loch and 5 Pink-footed Geese were also present. The Reed Warbler and the Garden Warbler remained; 5 Collared Doves, 3 Chiffchaffs, a Spotted Flycatcher and 2 Siskins were seen; and 4 Grey Herons were around Ancum Loch. A light sprinkling of common migrants from the gentle easterly breeze was an improvement on the previous few days. There was nothing rare, but a Yellow Wagtail, a Reed Warbler, a Garden Warbler and a Pied Flycatcher were all noteworthy. Other small migrants included 4 Collared Doves, 2 Common Whitethroats, 1 Blackcap, 3 Chiffchaffs, 2 Willow Warblers, 2 Spotted Flycatchers and a Common Redpoll. A flock of 6 Common Scoters flying past Twingness was quite unusual, and 3 Grey Herons were present. Although an extremely quiet day for birds, a pod of at least 5 Orcas just offshore from the lighthouse more than made up for the dearth of migrants. Initially seen far out to sea from the north of the island, they eventually found their way to Seal Skerry and spent a while harrying its eponymous inhabitants before heading quickly out to the north-east in front of a hurriedly assembled crowd of onlookers. Lingering birds included the Bean Goose and a drake Garganey on Hooking Loch. A Little Stint and a Merlin were just about the only new birds during another very quiet day. The Bean Goose, 2 Pink-footed Geese and a Garganey were around Hooking Loch; 2 Chiffchaffs, a Willow Warbler, a Siskin and a Collared Dove were at Holland House, and 4 Manx Shearwaters were seen at sea. There was nothing out of the ordinary to report, and the only common species worth mentioning were 2 Siskins, a Common Redpoll, a Blackcap, a Chiffchaff, a Willow Warbler, 2 Woodpigeons and 2 Collared Doves. 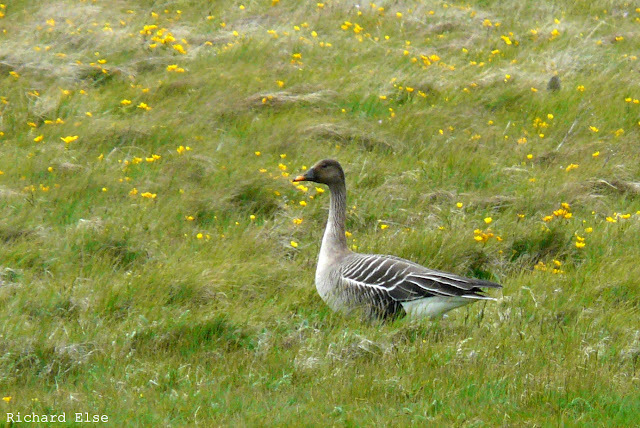 A Taiga Bean Goose near Sangar was a totally unexpected and very unseasonal sighting, as well as an addition to the island year-list. Bean Goose is a scarce, although fairly regular, visitor to North Ronaldsay, but usually only in the winter months: all previous observatory records have been during the period of October to April. There was very little else of any interest. A drake Garganey was near the mill again, 3 Siskins, 2 Common Redpolls and 5 Bar-tailed Godwits were seen, and a count of 87 Dunlins was an increase on recent days. Taiga Bean Goose: an absolutely fabalis June bird. The North Ronaldsay summer began with a morning of force 8 mist, clearing for a short spell in the afternoon. New birds were few, but included a Quail outside the observatory and a Sparrowhawk. A Garganey was on Brides Loch, the 5 Siskins were still present, and a Woodpigeon, a Collared Dove, a Blackcap, a Chiffchaff, 2 Willow Warblers and a Spotted Flycatcher were seen.